Jason Ryberg is a Consultant for Microsoft, where he writes PowerShell code and provides DevOps support. Have you ever wanted to boot to WinPE in Azure and select an Microsoft Deployment Toolkit (MDT) Task Sequence? As part of an informal cloud-readiness evaluation, I was asked to deploy a server image to Azure. The image that I was given would run the MDT Deployment Wizard to allow for the selection of deployment options. But, how could I choose deployment options if I could not reach the Azure virtual machine in the boot environment? Read on to find out how to interact with an Azure virtual machine in a preboot environment! Plenty of moving pieces need to be precisely configured as part of the process. The following diagram describes the relationship of the components and visualizes the required configurations. Before you begin, ensure that you have met all the system requirements. Install MDT and WADK as usual with default values. Ensure that Hyper-V Services is installed on your workstation. It’s used to create a custom VHD. Track down the install bits for the Diagnostics and Recovery Toolset (DaRT), which is part of the Microsoft Desktop Optimization Pack (MDOP) and requires a Visual Studio subscription or Software Assurance. Because the MDOP requires Software Assurance to use legally, I cannot provide a direct link. DaRT is used to interact with the WinPE console remotely to complete the Task Sequence Wizard in Azure. In the Install – Install Operating System step, specify the partition to install the operating system. Change the Select the location where you want to apply this operating system dropdown to Specific disk and partition. Select 0 for Disk and 2 for Partition. Add the “Postinstall – Copy Scripts to OS Drive” to include a Diskpart script that’s used to remount the WinPE partition after reboot. Copy the assignPEletter.txt file to the Scripts directory of the Deployment Share. An additional step is required to ensure that the assignPEletter.txt file is run before the operating system is started. Right-click the FirstLogonCommands item, and then click New SynchronousCommand. Copy “cmd /c diskpart.exe /s %SystemDrive%\Scripts\assignPELetter.txt” to the Commandline Add an appropriate description, and change the Order to 2. Close the Unattend.xml file and confirm saving the file. Before deployment, the Task Sequence requires a delivery method, which MDT refers to as Media. Many options are available to creating Task Sequence Media. However, this post will only touch on the pertinent steps. Create Media if you do not have one, open your Media’s properties, and ensure that SkipBDDWelcome=YES is listed in the Rules textbox and the Bootstrap.ini textbox. By skipping the welcome page, the deployment wizard and the DaRT utility launch automatically. To install DaRT in your media, first download and install DaRT, then copy the required files from the DaRT installation path to your MDT directory. After you copy the file, open your Media’s properties, click the Features tab, and check the box next to Microsoft Diagnostics and Recovery Toolkit (DaRT) at the bottom of the list. By including the DaRT feature in the WinPE environment, you now have a method to remotely interact with WinPE. Finally, copy the DartRemoteViewer.exe file to your workstation. The Dart Remote Viewer is the tool that we launch to interact with our Azure virtual machine. But, how exactly do you connect to the WinPE environment? DaRT generates an XML configuration file – Inv32.xml – that contains the connection information, but the file is generated locally on the Azure virtual machine. Because you can’t reach the virtual machine in the preboot environment, the file will need to be copied to a readable location. To perform this task, I supplemented the check for DaRT bits in MDT’s LiteTouch.wsf script to mount Azure File storage as a local drive and copy the Inv32.xml file to that drive. Replace the If block starting on line 1576 in the LiteTouch.wsf file with the following If block. oShell.Run "cmd.exe /C a. net use [drive letter] \\[storage account].file.core.windows.net\[file service] /u:[storage account] [storage account access key] && copy /Y x:\windows\system32\inv32.xml J:\inv32.xml"
Note: Currently this method requires that your workstation be connected to the same virtual network as the target virtual machine. This is due to the default DaRT configuration connecting to the virtual machine’s private IP. Efforts to connect the DaRT service to the public IP are in progress. Next, we create the custom virtual hard disk (VHD) to contain our MDT Media content. Before beginning, please ensure that your image meets all the Azure prerequisites. Then, create the VHD container with two partitions – one for WinPE and one for the operating system bits. The VHD is, of course, created by using PowerShell. Create a VHD with two partitions – one for WinPE and one for the operating system. Note that the VHD is a fixed size, because Azure does not support dynamic VHDs. Update the Media, and copy the Media folder contents to the WinPE partition of the VHD that you just created. Write-Output "Copying updated content to VHD"
Copy the VHD to your Azure subscription. $StorageAccountName = "[STORAGE ACCOUNT NAME]"
And finally, create an Azure Virtual Machine by using the VHD as a source image. The entire script resource that provides this functionality is listed in the Resources section. Following are the pertinent parts of the script. $virtual machine = New-AzureRmVIRTUAL MACHINEConfig -VIRTUAL MACHINEName $virtual machineName -VIRTUAL MACHINESize "Standard_D1"
After running your virtual machine configuration script, the virtual machine provisioning process in Azure will start. To view the deployment, sign in to the Azure portal and find your new virtual machine. You can still view the virtual machine’s console by selecting the virtual machine, opening the Support & Troubleshooting section of the VIRTUAL MACHINE properties blade, and clicking Boot Diagnostics. A new blade will open with a screencap of the VIRTUAL MACHINE console. However, to interact with the console, connect to an endpoint that is on the same virtual network as the Target virtual machine. 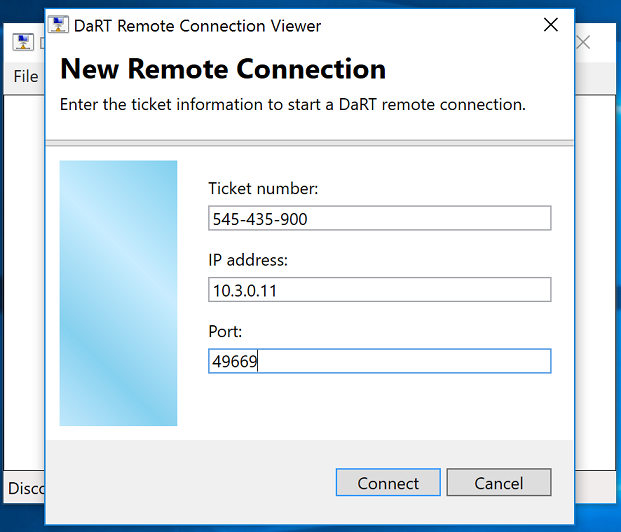 Launch the Dart Remote Viewer utility from your workstation, and copy the connection info from the Inv32.xml file on Azure File storage to the connection dialog box. After you click Connect, you should be looking at your WinPE environment in Azure, and you can interact with it, even completing the MDT Deployment Wizard. To improve this process, the first step would be to configure DaRT to attach to the public IP interface. This process removes the requirement that DaRT connections must come from the same virtual network. Additionally, this process can become even more automated by reading the XML file and prompting technicians for connection when a new connection file becomes available. Further, monitoring tools could be integrated to polish the connection process. I invite you to follow me on Twitter and Facebook. If you have any questions, send email to me at scripter@microsoft.com, or post your questions on the Official Scripting Guys Forum. Also check out my Microsoft Operations Management Suite Blog.